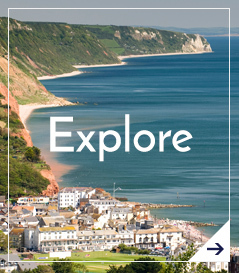 There are lots of places to visit and things to do during your stay in Devon. The county encompasses splendid scenery, picture postcard villages, beaches, fossil cliffs, medieval towns and moorland national parks. You can take a delightful stroll through the town and gardens of Sidmouth or a coastal walk along the famous South West Coast Path. The nearby cathedral city of Exeter is well worth a visit with its underground passages, historic quayside and array of shops and restaurants in the newly revamped Princesshay and Guildhall areas. Further afield, Dartmoor is a great for a day trip. Whether you like vast open spaces or country lanes with hidden villages, Devon’s National Park has it all. Honiton is famous for its lacemaking and antiques, whilst Ottery St Mary is one of Devon’s oldest towns. Its church was consecrated in 1260 and has been described as a ‘mini Exeter Cathedral’. Ottery is also the birthplace of the romantic poet, Samuel Taylor Coleridge. Lyme Regis, with its famous cobb and harbour, is surrounded by beautiful coastline and countryside. Hopefully this list gives an overview of some of the wonderful places to visit whilst staying in Sidmouth and Devon.